Quick trivia quiz. What do these names have in common: Bradstreet, Bacon, Dexter, Morgan, McKean? All are gates to Harvard Yard. Clockwise, from due north, they are: the newest gate, opposite the Science Center, a 1995 gift from Radcliffe honoring seventeenth-century poet Anne Bradstreet; the Robert Bacon or Class of 1880 Gate, monumental and unused, just south of Lamont; the Samuel Dexter or Class of 1890 (or “Enter to grow in wisdom”) Gate; the Edward D. Morgan or Class of 1877 Gate, the largest of all, just south of Widener; and the “Porcellian” or “Boylston” gate, ornamented with a boar’s head, dedicated to Joseph McKean, who founded the Porcellian Club in 1791. So says Gates of Harvard Yard (Princeton Architectural Press, $15.95), a collection of essays edited, introduced, and partly written by the Chicago Tribune’s Pulitzer Prize-winning architecture critic, Blair Kamin. This is a book that began as a week-long Harvard Wintersession 2013 class in arts journalism led by Kamin during his year as a Nieman Fellow. Its collection of essays and photographs by students and instructors was issued later in 2013 as a Nieman Foundation e-book (see harvardmag.com/harvardgates-16 ). Now a new paperback puts those essays, with fresh color photographs, drawings, and a map, into your coat pocket. Gates are for getting through, but Kamin, his fellow instructors, and their students ask us to pause and contemplate: a fence excludes, a gate admits—but selectively. Both assert power. No wonder Harvard’s wrought-iron pickets bristle with spear points. Until the 1880s, Harvard had made do with rustic wooden rails on granite posts. Monumental ironwork enclosures were part of Charles William Eliot’s imperial ambitions for his university. The Johnston Gate—the first to be built, in 1889—was the work of Charles McKim of McKim, Mead, and White, the New York architects who would shape much of Harvard’s and the nation’s rise to international prominence in the next few decades. McKim set the pattern for Harvard gates: Georgian, not Gothic; “Harvard brick” of variegated hues with stone accents; iron spear-points with floral flourishes. From gates, the neo-Georgian style spread to buildings and made much of the Harvard we know today. 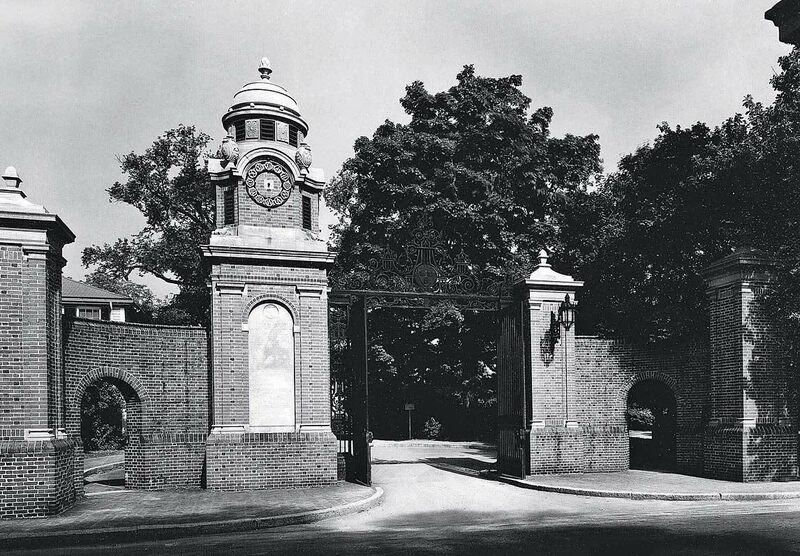 By the University’s Tercentenary in 1936, the Yard was fully fenced and gated. But of today’s 26 gates, nine are locked permanently or opened only rarely. Some have been blocked by new buildings, made useless by new traffic patterns, or denied the spacious malls they were supposed to face. Some languished in disrepair. Kamin’s work inspired repairs to the Johnston Gate, but two of these essays point out other gates still in need of restoration.